Equity markets worldwide continued their upward trend in February driven by buoyant economic data from U.S. and renewed hopes of a workable solution to Euro Zone Crisis. Indian Markets too kept up their pace with the global rally for most part of the month but gave up some gains during the last week on concerns over soaring crude price and its effect on the domestic economy. On the whole, the benchmark Sensex moved up by 3.25% during the month and closed at 17753 points. MSCI India recorded a gain of 4.78% as against MSCI EM’s rise of 5.89%. The mid and small cap indices continued their outperformance over the large caps by moving up 8.8% and 6.1% respectively. FIIs emphatically displayed their current risk appetite and liquidity by buying equities worth USD 5.12bn in February, their fourth highest monthly net-inflow since their entry into India. Meanwhile, domestic mutual funds continued to be aggressive net sellers in the equity segment taking out about USD 421 mn. Global markets have seen a resounding rally since ECB’s first liquidity injection of EUR489bn during Dec 2011, somewhat similar to QE1 driven emerging markets rally in late 2010. However, market performance during QE2 phase was subdued. It remains to be seen how the second phase of ECB’s Long-Term Refinancing Option (LTRO) program involving 530 billion euros (higher than expectations) announced during end of February impacts the global risk assets going forward this year besides the real economy of EU in the mid-term. The Greek package – Voluntary Private Sector Initiative (PSI), second bailout package and extended fiscal austerity – that has been agreed recently has cut down the risks of immediate default and disorderly exit from European Union. However, the upcoming elections in Greece and France besides a range of important countries like USA, China, Russia and Egypt could magnify policy uncertainties in respective regions with corresponding global effects. In the Indian context, FII inflows would be a key derivative of global risk appetite and liquidity funnel. Meanwhile, Oil prices have been creeping up, partly on recovery hopes but also reflecting political tensions in Iran and Middle East. The Brent prices have so far not broken out of the USD 95- USD 125 per barrel range seen since early 2011. But, if Iran nuclear issue escalates and triggers a spike up to USD 150 per barrel then economies worldwide may again shift back to a mood of caution. India’s Real GDP growth fell to a 3-year low of 6.1% yoy in Q3FY12 (against 6.9% in Q2FY12), slightly lower than consensus expectation of about 6.3%. The data clearly shows that economy is undergoing an industry led slowdown. Industrial growth remains weak at 2.6% yoy, primarily due to contraction in mining (3.2% yoy) and puny manufacturing activity (0.4% yoy). However, on the positive side, construction activity (including construction of roads, bridges, ports and housing) has shown healthy pickup (7.2% yoy), auguring well for investment activity. Despite healthy construction growth, investments – as seen from expenditure side of GDP – posted quiet weak growth (1.2% yoy) which possibly reflects dull capex activity in the economy. In recent years, the economic growth has been driven more by consumption than by investment. Continuous slow-down in investment activity will affect the consumption with lag, which is a worry. Meanwhile, services sector continued to post healthy growth (8.9% yoy vs 9.3% last quarter), providing the much needed support to the economy. Continued resilience of the services sector could be due to the fact that majority of its sub-sectors such as trade, transport, government spending etc are largely immune to the adverse business cycle conditions, a phenomenon observed during 2008-09 downturn as well. Going into Q4FY12, industrial growth should improve, as suggested by pick up in manufacturing momentum in Nov-Dec period (refer fig-2), improvement in mining activity and jump in forward looking PMI data. Besides, base effect will also be supportive in Q4. Overall, we believe Q3 marks the bottom of the ongoing economic downturn, although pick up is likely to be very gradual. We expect GDP growth for FY12 to be about 6.9-7.0%. January inflation came in at 6.55% as against 7.5% a month ago, marginally surprising on the down side. The decline was mainly on account of base effect in the primary articles side rather than any meaningful drop in prices. Core inflation (non-food manufactured products) dropped sharply to 6.68% from 7.7% in December. Considering the seasonality in the food prices segment (mainly vegetables) that is currently pulling down the inflation and hardening of crude oil prices, RBI may not cut rates in its review meeting on March 15. The central bank has also signaled that it will be difficult to contain inflation without a proper support from fiscal side. Hence, we expect that it would wait and review the fiscal proposals in the union budget to be presented on March 16 before starting to ease policy interest rates. 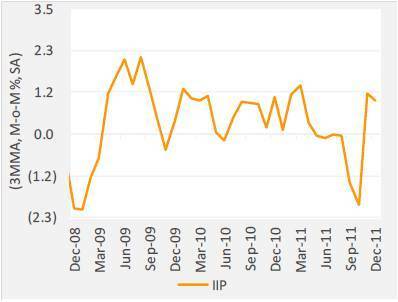 The Index of Industrial Production (IIP) grew 1.8% yoy during Dec 2011, considerably lower than the consensus estimate of 3.4%. While the monthly numbers seem weak, it could partly be due to the de-stocking effect post the stronger than expected growth in Nov 2011 (5.9% yoy vs 2.1%). Capital goods production continues to remain weak, confirming the slow-down in investment activity. Though the PMI in manufacturing indicates that the worst is over for IIP, it will take time to recover significantly considering the global and domestic headwinds. At the beginning of the year, it was widely expected that the Indian Markets would turn around gradually in 2012 with major upside expected towards the latter half. However, the remarkable change in global investor risk and liquidity climate combined with change in RBI policy stance has fast tracked the market rally much to the surprise of the domestic investors. While the large caps have risen about 15%, the mid and small caps have moved up about 24% with certain beaten down sectors and stocks even seeing a 100% increase. Considering the sharp rally in such a short span, we expect the markets to switch into review mode in the near-term with important domestic economic and political events like state election results, RBI policy review and FY2013 Union budget lined up in March. Also, the oil price movement and development in EU (Elections in Greece & France and the impact on bail-out package) would keep the markets cautious. With the ruling party facing an election debacle in the key state of Uttar Pradesh, the penultimate budget to be presented by the current government in mid-March will be one of its last opportunities to do something constructive that will create a positive impact pan India. The finance minister has his task cut out in pruning the fiscal deficit by raising some indirect taxes, broaden the service tax net and simultaneously reduce the subsidy bill. This process is going to be extremely painful considering the current status of economy. High fiscal deficit leads to increased state borrowings for unproductive purposes thereby crowding out private sector fund needs for capex investments. Also, several key bills like the Lokpal Bill, the Food Securities Bill, the Companies Act Bill, GST (Amendment) Bill, Direct Tax Code and Mines and Minerals Regulation Bill that have been tabled a while ago have still not been able to obtain the parliamentary approval. With the state election results behind (and also unfavourable), markets would keep a close tab on how the congress government moves ahead with its long over-due reform process. 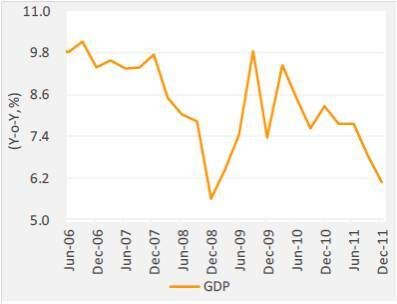 With GDP growth touching a 10 quarter low of 6.1% for the quarter ended December ’11, it is now widely acknowledged as a missed opportunity among the investment community largely reconciled to 6.5 to 7% growth. While investment trends remain lackluster, we hope that the recent announcement regarding ‘fast-tracking’ power and coal issues is not another false start. Despite good FII flows and consequent rally, it is difficult to confidently claim that this is a new bull market as it seems to have already factored in lot of expectations on improved governance and fiscal consolidation. Though capital flows can take markets higher in the immediate term, it is hard to imagine that the flows will off-set the problems on the current account side. Even if we assume that the worst phase of slower GDP growth is behind us, the earnings upgrade cycle is sometime away. We believe in the secular long term growth potential of India’s consumption led economy, and reflect it in the way we build our portfolio. But we accept that we will be subjected time and again to the self-fulfilling inflation led interest rate cycle, and must bear its consequences upon Growth and Valuations. Our longing for better policy led measures to address the supply-side issues that lend inevitability to the inflation cycle, remains a hope today. Consequently, we accept the sub-optimal performance of India’s economy as the norm and focus upon the opportunities that arise from the volatility. While the reversion to mean of mid and small cap valuations has commenced, there is still plenty of scope in this trade, and we expect small and midcaps to continue their out-performance over large caps. Sectorally, we continue to prefer financials and rate sensitive sectors in the expectation that RBI will cut rates soon. We expect Oil prices and currency risk to be led, in the near term, by the Iran situation. At this point, we are factoring in a prolonged negotiation between the world powers and Iran; not an all out war.